Greetchen "José, when we think about carnivorous plants sometimes we believe that it refers only to the ones that catch flies like those in the Mario Bros games, but there are other types too." José: "That's right, there are also carnivorous plants (or insectivorous) that live in the water" In this photo we are showing an aquatic and insectivorous plant of the genus Utricularia." Greetchen: "Tell us more about these aquatic plants." José: "The photo shows an utricle or the sac that traps small animals and protozoa. 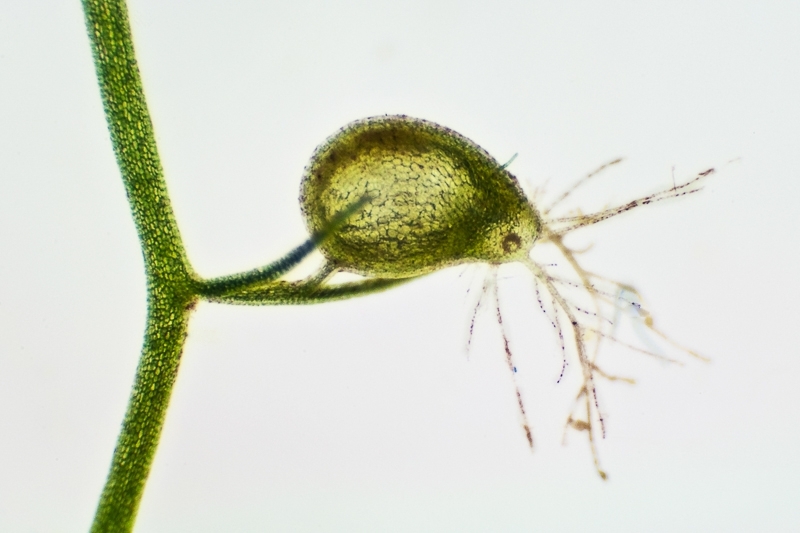 The utricle which measures about a millimeter, has some trichomes or hairs that looks like algae and attract the prey. The opening and closing mechanism of the bag is considered to be the fastest capture mechanism among carnivorous plants. " Greetchen: "Very interesting, and where are these insectivorous plants commonly found?" José: "The genus Utricularia is ubiquitous and can be found all around the world. In Puerto Rico there are five reported species, all of which are considered native. Official reports indicate that there are species in the Yunque Forest and others in the area of Vega Baja and Manati, in the Tortuguero Lagoon. " Greetchen: "And do you think there are more species to be discovered here on the island?" José: "It is very likely that there are Utricularia in other parts of the island. Some time ago and to my surprise, a professor called me because he thought he found an Utricularia in a small lagoon in Mayagüez, and indeed, when we visited the lagoon there it was! " Greetchen: "And how could they have gotten there?" José: "These plants are seasonal and decrease in numbers during the dry stages. Then, they becomes evident during the rainy months. So it's very likely that they have been dispersed by birds that generally visit the wetlands. "